Our last in this series of tributes to dance happened about 2010. I was enjoying a patio in Boise’s Hyde Park. On the grass median between the sidewalk and the street a fun trio was playing western swing. Well. Don’t get me near a slide guitar. I couldn’t help but get on the sidewalk and start to dance. As my fellow patio diners looked on with expressions of indulgence, jealousy, or what a jackass, there were five high school girls kitty-corner from the patio. The second they saw me dance they spontaneously shrieked with enthusiasm, ran across the road, and joined in. They were filled with the glee to dance and it was a joy to see. It was not until they were on the sidewalk, dancing, that any of them hesitated, aware others were watching. So I distracted them with a twirl or two and all was well. Here’s to the celebration of being we call dancing, my friends! (Clink!) I’ll see you on the floor. 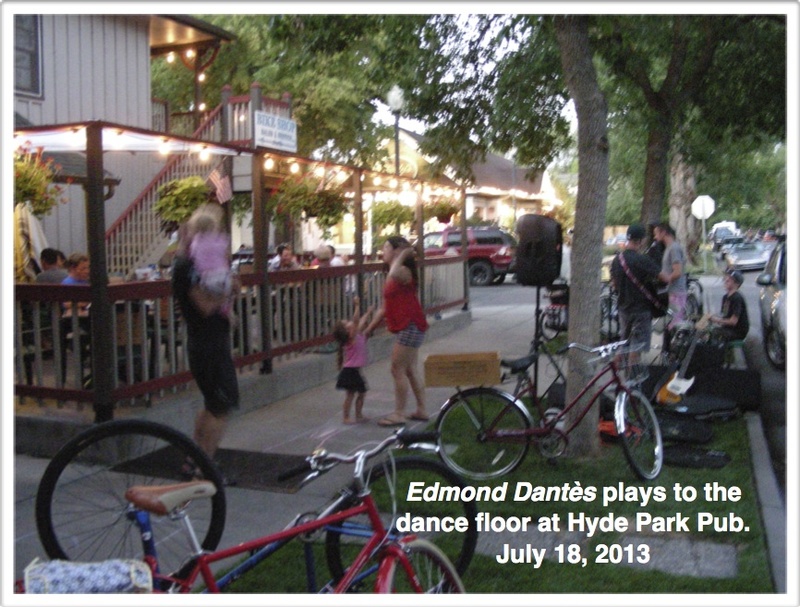 This entry was posted in Dancing #1 and tagged #5 dance, Hyde Park, street dance on July 20, 2013 by deansgreatwahoo. What fun! I see you’ve been busy here, Dean. I thought I was following you, but wondered why nothing showed up in my reader. I’ve clicked the follow again. We’ll see what happens now.